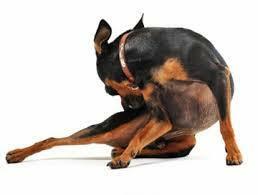 Fleas are an extremely common problem especially in the warmer seasons. However, fleas can also thrive in the autumn and winter seasons in heated homes which is why it is important to use preventative treatment all year round. 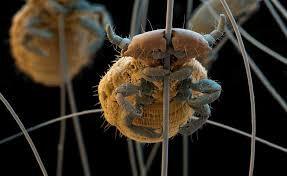 Did you know 95% of fleas live in the environment? 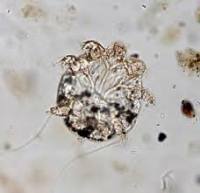 So, if 50 fleas are living on your dog expect to find another 950 living in your carpets, bedding, cars and airing cupboards etc. 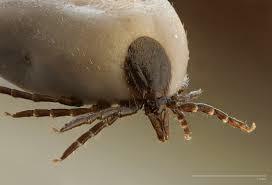 Therefore we always recommend treating your home if your beloved pet has a flea infestation. 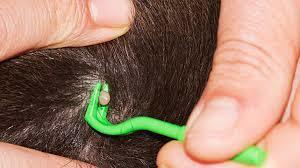 Fleas carry worms so it is likely if your animal has fleas it will also have a worm infestation. Over 2000 species exist, the most common we see are the dog flea (Ctenocephalides canis) and the cat flea (Ctenocephalides felis). 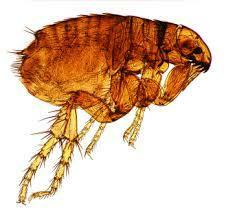 These fleas are difficult to spot, they are extremely fast and can jump up to 33cm. 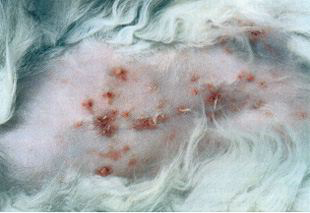 Flea dirt (as shown in the picture to the right) is one of the common signs of a flea infestation. Female fleas can lay up to 200 eggs per day and a single flea can bite your dog hundreds of times per day. 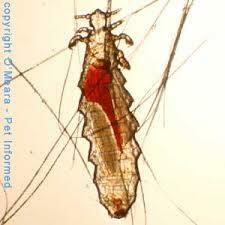 Fleas can cause further complications such as Flea Allergic Dermatitis and anamia in severe cases. They also carry other harmful viruses and diseases. 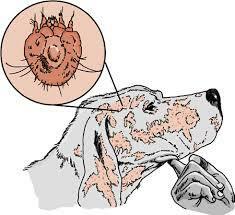 It is also important to be aware that fleas are not fussy what species they feed from- they also bite us humans too! Well, we would always recommend preventing them so you more than likely will never need to 'get rid' of an infestation. We can tailor a preventative health care plan to meet the needs of your pet. However if you do have the pesky critters set up camp on your animal and in your home, we can also provide treatment to help eliminate them. Just pop in to see us or call for more info. 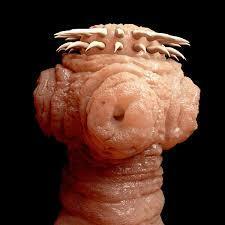 Roundworm (Toxocara spp) are found in the gut. 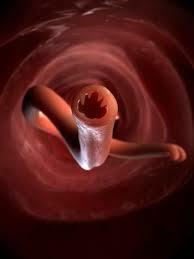 Roundworms look like pieces of string and occassionally may be seen in faeces or can be vomited up. Worm eggs are passed in the faeces of infected dogs and they remain in the soil. Children can pick up infections from contaminated soil by putting their hands in their mouth after playing. 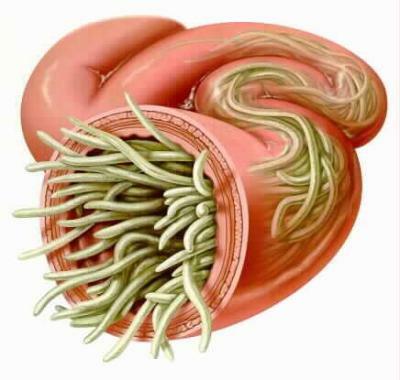 Although serious consequences of a Toxocara infection are quite rare, these worms can cause blindness, heart problems and epilepsy in humans especially small children. 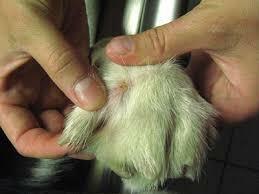 Puppies and kittens can also be infected with worms whilst they are in the uterus and through the mothers milk. We recommend using preventative treatment to avoid a roundworm infection. Tapeworm are found in the gut and are long and flat with segments which look like grains of rice and can sometimes be seen in the faeces. 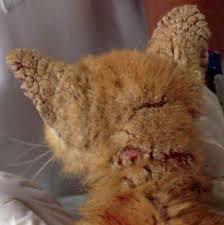 Cats and dogs contract tapeworm by ingesting an infected intermediate host such as a flea. If your pet has a tapeworm infection, you may not realise as cats and dogs infected with adult forms of the tapeworm often show no symptoms. In extreme cases, and if humans inadvertently ingest some types of tapeworm eggs, cysts can develop within body tissues. 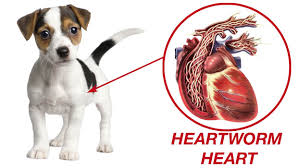 Hookworm eggs are passed in dog and even foxes’ poo, and are left in the environment. Animals are infected by ingesting larvae from the environment. How can my pet contract Biting Lice? 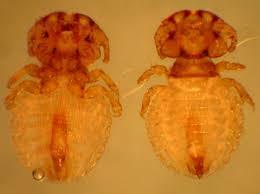 Lice are highly species specific; the dog louse will therefore not affect humans. 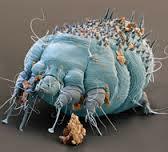 Trombicula autumnalis are surface mites found worldwide. 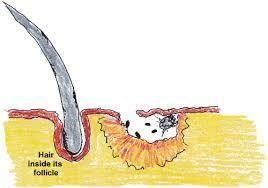 It will attack and parasitise any animal including humans, causing parasitic skin infestation (trombiculidiasis). 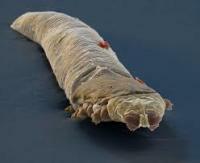 Only the larval stage is parasitic however, and adult mites are found living in the soil. 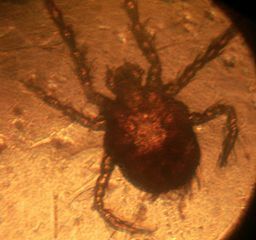 The mites are bright orange in colour and hairy. They have six legs and no spiracles. They breathe through their cuticle. 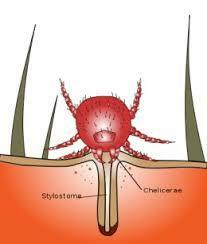 The lifecycle of Trombicula autumnalis mites lasts around 50 to 70 days. The nymphal and adult stages are free-living in the soil. Eggs are laid in soil and once hatched, larvae climb up vegetation in search of a host to attach to. As the name suggests, numbers are greatest in 'harvest' time, late summer, in temperate climates and all year round in the tropics. The larvae insert their mouthparts into the host's skin and inject cytolytic enzymes. 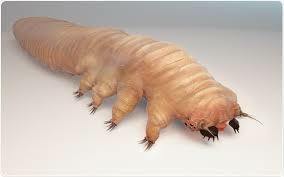 They then feed on partly digested host tissue causing irritation and potentially a hypersensitivity reaction. 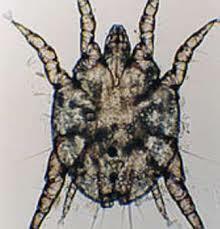 The Mites are mainly found on the head, ears, toes and flanks of pets and can be found on the face and limbs of grazing animals, depending upon the host height.